Magento Content Management System powers 26% of top Ecommerce websites. What makes this CMS incredible? It’s definitely customizable design, product pages and responsive layout, multistore support, ability to add custom content fast and easily, ability to display brand logo for each product and much more. If you are Magento based website owner and looking for Live Chat software to equip it, Provide Support is glad to offer an intuitive in integration and powerful in features Live Chat module for Magento. Live Chat tool has become a must have option for all eCommerce websites recently. Try the module to see how it works for your website visitors. What kind of integration options are coming with Provide Support Live Chat Module for Magento? Ability to use set of live chat icons defined in the account settings of the Provide Support account Control Panel. Possibility to generate text chat links and apply HTML formatting to them. Using own custom images. This is a great feature for those website owners who use one account on several websites and would like to have different set of Live Chat icons displayed there. Support of positions available with Magento theme – the position for the chat button can be selected from the drop down menu which contains available positions. Adding the chat button to a fixed position on the browser window. This feature will make the chat button follow your website visitors while they are scrolling the page up and down. A rich set of live chat icons is available for this purpose, including vertical images, have a quick glance at them in our gallery. Displaying your live chat button on all predefined Magento store pages or within single posts created in CMS/Pages. Ability to monitor the whole website if the chat button was hidden on some pages. This feature is very useful and lets see the whole list of website visitors in real time. How easy is to start using Provide Support Live Chat software? 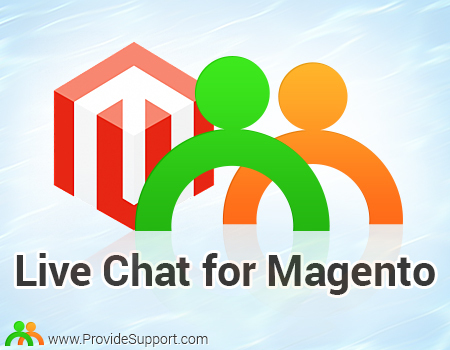 To start using Live Chat tool on Magento based website you need to follow System / Magento Connect / Magento Connect Manager in your admin panel and install the Live Chat Module. In ‘Provide Support Live Chat Settings’ menu you’d need to create an account or log into your existing one and configure your chat button position, image and its appearance settings. Additionally, you may further customize the Live Chat on Provide Support’s website in the account Control Panel. For assisting website visitors your Live Chat representatives would need to download and install the operator console on their computers and log into it to appear online and start accepting Live Chat requests from website visitors. With Provide Support Live Chat software free 10-day fully functional trial is available for system testing. All new users can start with it to see how the Live Chat tool works and what kind of benefits it will bring to website owners. This entry was posted in News, Tips and Tricks and tagged Live chat for Magento, live chat module, Magento Chat Module, Magento Live Chat Module. Bookmark the permalink. Few Examples of How Web Design And IT Companies Have Benefited From Adding Live Chat Support Channel to Their Websites. We want your extension for magento and need some customization on username level. Can customization possible in your chat system. Thank you for your interest in our live chat service. What kind of customization are you referring to? You can contact us in our 24/7 support chat and our representatives will assist you with any questions you may have. Good Post, I agree liveChat is the best extension for Magento, though In past I had some issues with its integration, but thanks to an awesome tutorial on Magenticians, this issue is covered too.